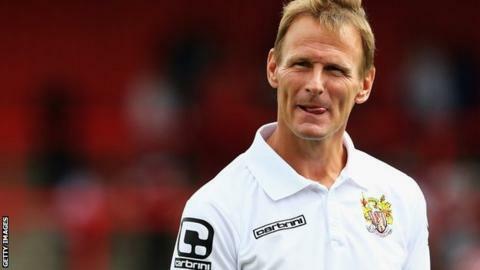 Stevenage manager Teddy Sheringham says his side's second-half display in the 3-2 defeat by Barnet was "woeful". Tom Hitchcock's 50th-minute header put Boro 2-1 ahead, but Aaron Mclean and Michael Gash gave the Bees victory. "We knew the game was going to change, there was no way they could be as bad in the second half as they were in the first half," said Sheringham. "We talked about that at half-time, but still we allowed them to do what they wanted to do by gifting them play." Sheringham's side have only won two of their opening nine games in all competitions, having reached the League Two play-offs last season under previous manager Graham Westley. They had looked on course for their first away victory of the new campaign on Saturday when on-loan Hitchcock scored his second goal for the club. But former England striker Sheringham said his side invited too much pressure on themselves in the second period. "It was a great goal from our point of view, but the momentum was still there from the home support because of us letting them come on to us," he told BBC Three Counties Radio. "It's not what we worked on, so I'm bitterly disappointed. We got to 2-1 and you think it would stem the tide, but they were getting so much joy at that time that they were willing to carry on what they were doing and we let them."